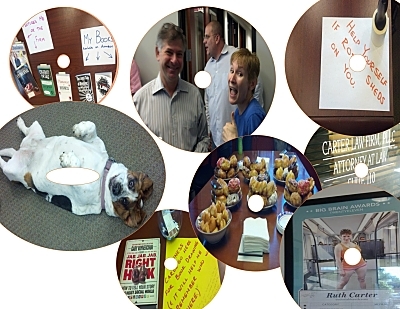 If you’re like most lawyers, your office probably did little or nothing to mark National Doughnut Day. If that’s the case, then your office must not be that of Arizona attorney Ruth Carter. Ruth has many attributes and high points in her brief career—including being named an ABA Legal Rebel and being an author of multiple books. And now we can add pastry-sharer. I mentioned doughnuts, so let’s get to it. Ruth is aware of the great value in social interactions. And why not: One of her areas of focus is flash-mob law. So a day dedicated to fried-dough goodness seemed to her as good a time as any to gather her myriad circles in her new law offices. A Venn diagram with smiles and Bosa doughnuts at the center, you might say. 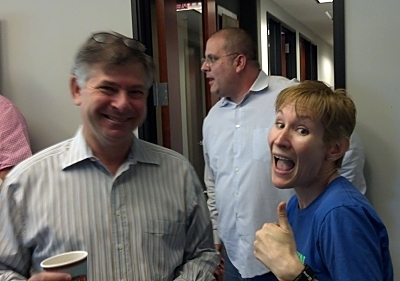 Every exuberant, Ruth Carter greets guests at her Doughnut Day open house. The June 6 event gave attendees the chance to visit with folks in different but affiliated industries. And we all got to catch up with what Ruth has cooking in her own practice. Smart move, that. 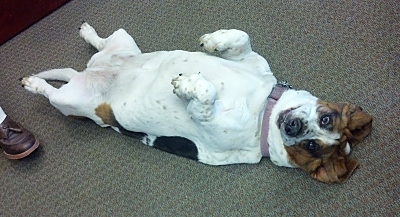 Plus, her wonderful Basset, Rosie, was present, as always. Thanks, Ruth, for kicking off our June well. Here is the thank-you note I posted after the sweet, sweet event. Doughnuts = the circle of life (or something, my thank-you note tried to convey). And how do you gather people informally in and around your practice? Doughnuts work, but they’re only one idea. Share yours!